When the first Star Wars film was released to theaters, I was not yet even born -- my birth was still a few years off. Still, the film franchise greatly impacted my life. How? I saw the films on VHS later on, but more importantly, I had the action figures and other collectibles. My mom even bought me an R2-D2 garbage can for my bedroom that brought me great joy. My story is not unique; people of all ages have been impacted by the films. Sadly, the six-film movie collection has never been available for digital download -- well... legally at least. Many fans turned to the dark side and downloaded the movies using torrents and other methods. Today, Disney announces that the films will be coming to digital download services, such as iTunes, Google Play and Xbox Video. If you choose to buy it through Xbox Video, you will even get some cool exclusives. "Since the debut of the first film nearly 40 years ago, Star Wars has become a worldwide phenomenon with legions of fans from every generation. It's only fitting that audiences enjoy this legendary saga and its many fascinating behind-the-scenes stories on a wide variety of platforms, and we're very excited to finally bring all six films to Digital HD for the first time", says Alan Bergman, president, The Walt Disney Studios. Major Nelson, explains, "Microsoft is offering two exclusive incentives for fans who purchase the six-film bundle on Xbox Video. 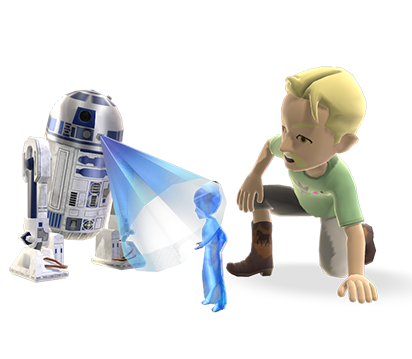 First, they will receive everyone's favorite scrappy astromech droid, R2-D2, as an Xbox Live avatar companion that flashes characteristics of classic R2-D2 from 'A New Hope'. Also, they will receive the action-packed Star Wars Pinball Pack for the free-to-play game Pinball FX 2, for Xbox One or Xbox 360. The Star Wars Pinball Pack lets players relive the greatest moments of the Star Wars universe on a set of brand new pinball tables". 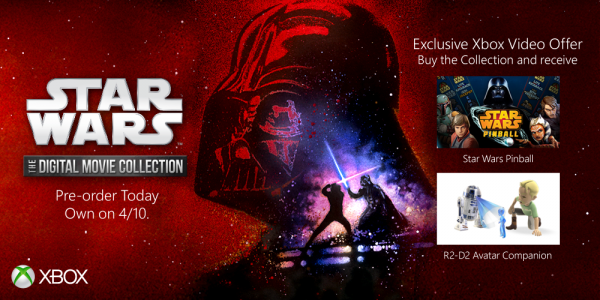 The entire collection is available for pre-purchase now for $99.99. While the price is not exorbitant, it isn't low either. Let's not forget that many fans of the film already own it; likely on various formats as they upgraded through the years. If you already own the Blu-ray versions, spending an additional hundred bucks for the digital downloads may be a hard pill to swallow. With that said, if you own VHS versions or don't own the films at all, it may be a good value. The films will be available on all popular platforms, such as iTunes and Google Play. If you are planning on buying the digital films, you might as well buy the Xbox Video versions for the aforementioned exclusive offers though, right? Plus, Microsoft promises a 60 second "featurette" video for Xbox customers only. You can pre-purchase the films here and they will become available on April 10th. Will you buy it? Tell me in the comments.